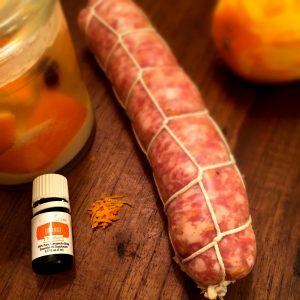 I had been wanting to make an orange salami for a while now. Honestly, I don’t even remember where I heard about it before, but it sounded like a great idea. The first version that I did didn’t turn out to taste anything like oranges, it relied mostly on orange zest and orange oil, but apparently all that flavor and aroma disappeared in about 5 weeks of drying. I did get a tip about how to change this when I first shared my frustration with that. The trick involved using the actual orange peels and curing/brining them 10 days before. I’m not sure if this will work well without the initial brining step. I guess it may be worth trying out in the future. 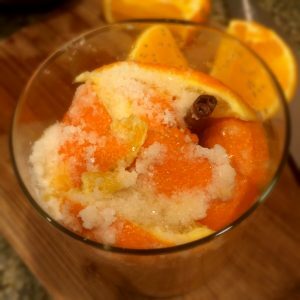 Start by “curing” the oranges by cutting a whole orange into large chunks and in a jar squeeze the juice a little and add a healthy amount of salt. 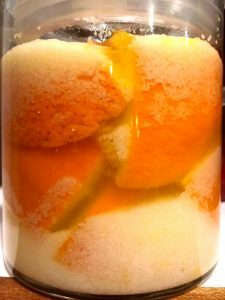 The juice from the oranges will come out and mix with the salt to create an “orange juice brine”. Leave the peels there for about 7-10 days. Once those are “cured” you are ready to begin your sausage making. 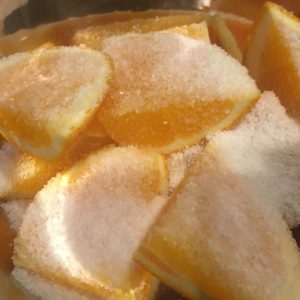 35 g of salt-cured orange peels, grind together with the meat. Ferment for 48 hours at 65 F-75 F (18 C-24 C). Then set to dry until it looses about 40%. Color may not be the nicest, but it taste great to me!